at No Vacancy Project Space, Melbourne, Australia. That the art and design practices of Shun Kawakami are inextricably linked shouldn’t surprise those familiar with his work, for he is, more than anything, a visual communicator whom cares not to be defined by the one marker. Born in Fukagawa, Tokyo in 1977, Kawakami’s creative output spans art, design, video, music, installation and spatial interventions. His aesthetic language leans as heavily on negative space as it does the depiction of a particular subject. Through his masterful equilibrium of light and shade, the existent and non-existent appear to intertwine, neither fighting for nor hiding from distinction from the other, rather melding as a proclamation of artist’s poised state. And it is in this balanced state that we find the translucency, the grain, the texture and the reflectivity of the ground material so crucial in forming the image as an object in itself.One immediately senses energies at play here, both real and imagined. 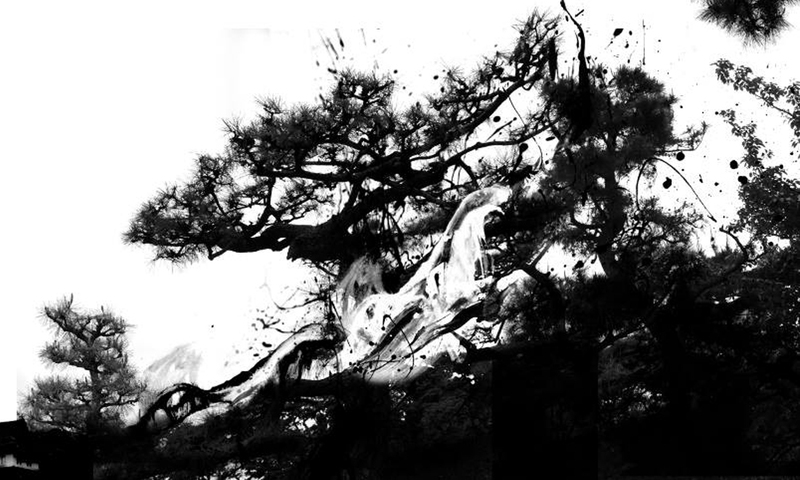 The physicality of mark-making in the inclusion of calligraphic strokes and splatters of a liquid, albeit digital, hint at movements driven from Kawakami’s subconscious, at pace and perhaps even before our eyes, as if we are witnessing a transient moment. These dream-like, organic subjects could be stills from a video – a fragment of a greater landscape that we are familiar with, but cannot place. In this way, there is a fleeting sense that Kawakami is provoking us through these singular marks of permanence by suggesting they are but one part of something much grander. In doing so he is manufacturing suspense in the drama of his much broader artistic practice.Yet, in complete contrast, these are settling works. They speak to us quietly, without urgency, instead inviting and encouraging the luxury that time spent will afford us when viewing them.